The German artist Hans Hoffmann once said “The ability to simplify means to eliminate the unnecessary so the necessary may speak.” At EXOR we have spent 2016 following his advice – although getting there has not been simple. We ended the year with a single company – EXOR NV – sitting between our investments and you, our shareholders, rather than the ten that existed when we first started this process a decade ago. EXOR NV, our new company, is a lean organization comprising twenty talented individuals ready for new challenges. Most of our previous EXOR colleagues have found new roles within our businesses. We are delighted to see this happen because it demonstrates how high-potential individuals can build careers within EXOR, and it helps to foster a common culture. It also ensures our overhead is in check and keeps us close to the businesses where value is created for customers and shareholders. Our Netherlands domicile not only brings us closer to our companies, which are mainly incorporated there, but also allows us to create a “loyalty” shares which has worked well for CNHI, FCA and Ferrari, and incentives long-term shareholders with increased voting rights based on the duration of their ownership. Long-term is how we think about our business and we want to encourage our shareholders to do the same. The other significant change we made in 2016 was to use NAV per share, rather than just NAV growth to measure our performance. We believe this is a more complete indicator and therefore more meaningful for our shareholders. We have also decided to align the new measurement more clearly with the majority of our assets and the revenue they generate by moving to a denomination in US Dollars instead of Euros. And finally, we have decided not to include capitalized ordinary holding costs in the measure. This means we now comply with the standard way the market calculates NAV and it helps us avoid confusing our annual costs with those we capitalize. For the avoidance of doubt, I would underline that this will not in any way reduce our attention to controlling our expenses – indeed in 2017 we are expecting to reduce costs to a level of less than 10 basis points of our Gross Asset Value. EXOR’s Net Asset Value per share in Dollars, or NAV per share, grew by 9.6% in 2016, outperforming by 4.3% the growth of the MSCI World Index denominated in Dollars (our benchmark). Our listed companies contributed positively, mainly driven by CNHI, whose share price increased by +25.5% and Ferrari, whose share price has increased by +23.5%. The following table traces our performance in the eight years since the creation of EXOR as we know it today, applying the new measures detailed above. It's worth noting that, had we stuck with Euro denomination, the compound annual rate would have been higher, reflecting a strengthening of the US Dollar. This said, we believe it’s correct to apply a measure that more properly reflects the geographical nature of our assets. The major change of the year has been the completion of our acquisition of PartnerRe on March 18. I would like to take this opportunity to tell you a little more about this company because it is now both the largest – and perhaps the least well known – of our investments. We are very lucky to have been able to appoint Emmanuel Clarke as CEO of PartnerRe. Emmanuel has risen through the ranks over the past twenty years within PartnerRe. He is supported by a newly constituted Board of seven directors, four of whom - Brian Dowd, Bilge Ogut, Patrick Thiele and Nikhil Srinivasan - are independent. Together they bring deep knowledge of the industry and considerable investment expertise. Emmanuel has wasted no time in initiating change within PartnerRe, which, while preserving its deep technical capabilities and its fundamentally conservative attitude toward risk, will strengthen its partnerships with brokers and insurance companies. Within PartnerRe's business, Emmanuel has put in place a leadership team that brings together experienced executives (two of whom were already part of the Executive Team), capable individuals from within the business (two new leaders have been promoted onto the Executive Team), and talent new to the company (two members of the team have joined from outside PartnerRe). One of these new comers is Mario Bonaccorso. Mario, who worked closely with me at EXOR over the past decade with growing responsibilities, was instrumental in our decision to enter the reinsurance industry and it’s great that he was able to join Emmanuel as CFO shortly after the transaction completed. He’s been very busy ever since and has already reshaped the investment side of the business by clarifying objectives, simplifying the number of investment strategies and streamlining its organization. Mario has reduced the number of strategies in the fixed-income portfolios from ten to four: government bonds, US dollar-denominated corporate bonds, Euro-denominated corporate bonds and agency mortgage-backed securities. These Fixed Income Investments, worth ~ $15 billion (89% of total investments at the end of 2016) back our reinsurance liabilities. To manage this book, we will continue to rely on the excellent work of the internal team of portfolio managers, who have consistently delivered benchmark-beating returns over the past several years including in 2016. The second-largest part of PartnerRe’s investment portfolio (representing 8% of the total and worth ~$1.3 billion at the end of 2016) is “Financial Investments”. This is composed of public and private equity, structured credit, ventures, funds and an ILS (Insurance Linked Securities) portfolio. Consistent with our will of avoiding investments we don’t know well or understand fully, we have de-risked this part of the portfolio and, by the end of the year, we had closed all public equity mandates and all allocations to high yield bonds and emerging market credits. In addition, at the end of 2016, the company also halved its “Principal Finance” mandate (~$885 million, yielding 7%), a structured credit investment strategy that has been successful in the past years but whose size, illiquidity, risk/reward profile and capital charge features were not in line with our current investment objectives. Real estate with its hybrid features, partially bond-like (rental income) and partially equity-like (capital appreciation) make it a relatively uncorrelated asset class, providing compelling diversification benefits. The company started its real estate investments by acquiring from EXOR ~ $0.5 billion (currently, 3% of EXOR’s total investments) of prime real estate assets in Central London in the form of a 36% equity stake in Almacantar. This company has enjoyed an excellent track record since its foundation in 2009, but in 2016 it suffered, like most central London prime market properties, from the Brexit vote, which reduced its market value by 7%. We are confident in its prospects given the fundamental supply/demand dynamics in the London real estate market. In addition, during the second half of 2016, PartnerRe invested in a new development project in Long Island City, New York, alongside Tishman Speyer. As well as bringing another geography into PartnerRe’s property portfolio, this investment has renewed my family’s collaboration with the Speyer family. More than 20 years ago, in 1995, we successfully partnered with Tishman Speyer to acquire Rockefeller Center in New York City and Rob Speyer is on EXOR's Board today. We look forward to working even more closely with Rob and his company in the decades to come. These changes in portfolio strategy have led to a simpler investment organization. In 2015, the company recorded net investment expenses of 31 basis points on its assets under management. PartnerRe enters 2017 with an annualized cost of approximately 12 basis points, among the lowest in the industry. As a result of these changes, PartnerRe starts 2017 with a stable and lean investment organization and a high quality, liquid portfolio that is absorbing less capital than 12 months ago. In 2016, PartnerRe achieved a Net Total Return of 2.4%, compared to 0.8% in 2015. However, its more prudent approach to financial investments, and particularly the reduction in its exposure to US equities, has suppressed our overall returns. I now want to turn to the underwriting side of the business. Here 2016 did not offer easy trading conditions, as natural catastrophe losses were back at relatively high levels across the industry. They caused economic losses of $210 billion during the year1, 59% above the historical median . These disasters generated $59 billion of insured losses for the reinsurance industry, 37% higher than the median. Five events generated 36% of these losses. This clustering means that a reinsurer’s exposure to certain risks and not to others – which depends on both skill and luck – can significantly change its bottom line. PartnerRe was obviously hit by some of these events, but the impact was broadly in line with that suffered by other reinsurers. It is the nature of this business for losses to occur so, as long as these risks are adequately priced, we’re happy to absorb them. Despite this increase in natural catastrophe losses, the oversupply of capital in the industry has meant that we haven’t seen the normal market response, which is for prices to rise. In January 2017 – which is when PartnerRe (like other reinsurers) renews approximately 65% of its total annual Non-Life insurance business – the market was characterized by a further erosion in pricing and terms that confirms our negative outlook for the coming years. Thus we believe we are likely to see the reserve release that the industry has benefited from starting to disappear. PartnerRe shrank its business (the amount of reinsurance business it writes) in 2016: net premiums were $4.9 billion (they were $5.2 billion in 2015). In doing so PartnerRe reduced its risk, because, in the first year of our ownership and in today’s environment, our preference has been to be cautious. In the Life & Health segment, premiums were down 3% from 2015 mainly due to deliberate cancellations of non-profitable mortality business. PartnerRe was also involved in some important transactions in 2016 which have strengthened its ability to grow when market conditions improve. I would like to highlight two of these here. First, PartnerRe took advantage of the exceptionally favorable environment for raising debt by issuing €750 million 10-year notes with an interest coupon of 1.25%. This issuance, for which there was demand exceeding €3 billion, represented the first debt raise ever by a Bermuda insurer and reinsurer in the Euro-denominated bond market. PartnerRe will achieve annual $16 million in pre-tax savings on its interest and dividend payments because it has used part of the proceeds to redeem $250 million of senior loans costing 6.875% and to redeem $150 million of preferred shares paying coupons costing between 6.50% and 7.25%. Second, PartnerRe has moved from being considered an acquisition target itself to becoming a partner capable of attracting other reinsurance businesses. The best example of this is Aurigen, one of the last remaining sizeable North American Life reinsurance businesses, with virtually no client or business overlap with PartnerRe. Life is an important line of business for PartnerRe, and one which has resilient returns. It also brings into the company a strong team and a capable leader in the person of Alan Ryder. This ~$300 million cash acquisition (at 1x book value) sends a strong signal about PartnerRe’s determination to pursue transactions at reasonable prices that expand its reach and coverage. In terms of profitability, PartnerRe reported Net Income, net of non-recurring expenses, of $517 million for 2016 (vs $453 million in 2015), corresponding to a Net Income ROE of 8.6% (7.4% in 2015). So, a lot happened at PartnerRe in 2016 and, importantly, the company also generated more than $550 million of operating cash, net of transaction and severance expenses. The largest contributions to our NAV per share growth in 2016 came from CNHI, FCA and Ferrari, the three strong, global companies that emerged as a result of FIAT SpA’s transformation from a troubled Italian conglomerate, thanks to the unique talent of Sergio Marchionne. The result of this transformation is clear in the combined value of these companies which multiplied nearly seven times between March 1st 2009, when EXOR was created, and December 31st 2016. The final step in focusing FCA on its automobile-related businesses will be the distribution of its media interests to its shareholders. My family has long had an interest in the newspaper industry. La Stampa, Italy’s third daily newspaper with a strong presence in Torino and the North West of Italy, was acquired by my great-great-grandfather, “Il Senatore” Giovanni Agnelli, in 1920 and since then has always belonged to FIAT, which has preserved its unique identity close to its community and yet open to the world, with serious and impartial news coverage and some of Italian journalism’s finest and most respected editors. The creation of FCA’s second media interest, RCS, involved several steps. In 1973, during a very troubled political time in Italy, my grandfather invested in Corriere della Sera to help its owners, the Crespi family, address the newspaper’s financial difficulties and transition their ownership to the book publisher Rizzoli. In 1984, with a consortium of industrialists and financial institutions, FIAT SpA came to the rescue of the combined Rizzoli and Corriere della Sera business, which by then had become RCS and included the largest Italian sports daily Gazzetta dello Sport. By restoring the group to financial health, and providing stability of ownership, we were able to preserve an important voice of reason in the country for more than thirty years. In 2012, due to a combination of mismanagement and crises in the newspaper industry, RCS was on the verge of bankruptcy, with annual losses of €500 million and debt close to €1 billion. In response to this, FCA led a consortium to provide capital to safeguard the company, and by 2016 RCS was profitable once again, and had reduced its debt to €366 million, contrary to most predictions. 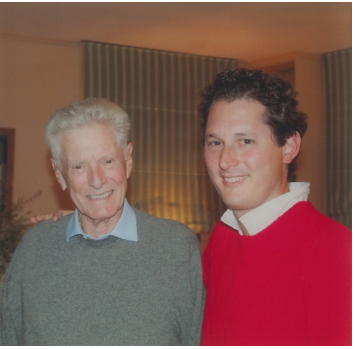 I have spent a lot of time with both La Stampa and RCS over the past decade because, like my great-great-grandfather and my grandfather, I believe in the importance of independent sources of information in a well-functioning democracy. However, the days are long gone when Lord Thomson of Fleet used to say “I buy newspapers to make money to buy more newspapers to make more money”. The two major sources of revenues for newspapers – advertisements and paid circulation/subscriptions – have both declined significantly in Italy over the past decade. The overall ad market has shrunk from €9.2 billion to €5.9 billion per year and newspapers have gone from capturing ~21% of the advertising market to only ~12% – with a 64% reduction in annual ad revenues. Although the digital ad market has grown, it did not replace the revenues lost and most of that growth has been captured by Google and Facebook, which now have combined Italian revenues of close to €1 billion. At the same time, paid circulation and subscriptions for all Italian newspapers decreased from 4.8 million to 2.5 million copies. 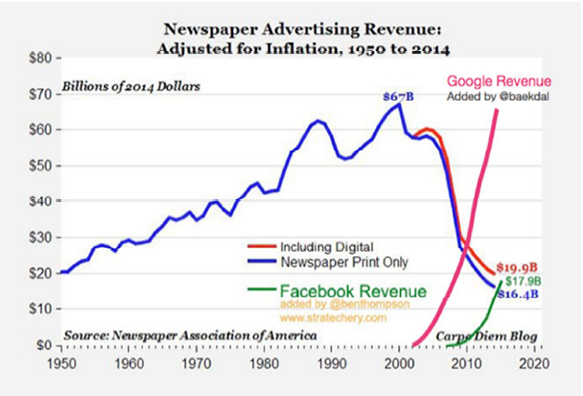 Globally the picture is a little better but the trends are similar, with print advertising declining from $146 billion to $80 billion per year and circulation revenues (including digital circulation) declining from $116 billion to $98 billion. 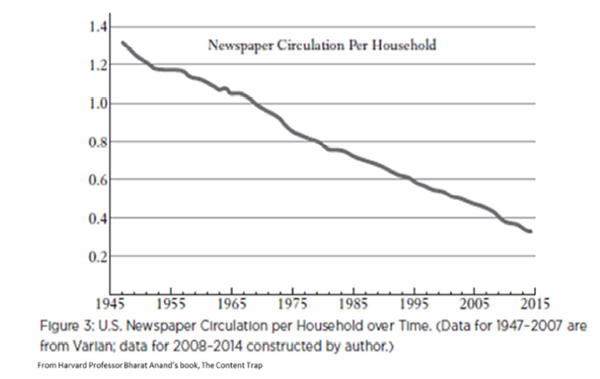 The two charts below provide a good summary of how the US advertising market, which is the largest, has shifted and how circulation has been in structural decline for a long time. To survive in this much harsher environment, La Stampa has been cutting costs and has participated in the consolidation in the industry by merging with Il Secolo XIX, the paper from Genova owned by the Perrone family who used to be the big rivals of Senatore Giovanni Agnelli at the beginning of the 20th century. But necessity brings old rivals closer, and the relationship with Carlo Perrone has been very successful, with ITEDI (the merged entity) closing 2016 with a profit and the highest operating margin in the industry. We have therefore undertaken a further transaction to combine ITEDI with GELE (Gruppo Editoriale L’Espresso). This was a very personal event for me, because GELE was itself founded by my great-uncle Carlo Caracciolo, the most successful publisher in Italy, from whom I inherited both a passion for newspapers and an understanding of their importance to society. Carlo’s dream was to see this combination and I am very happy that, with the De Benedetti family (with whom we share the same roots, because we are both from Turin and linked to the car business) who are the majority owners of GELE, we will create GEDI, the leading newspaper group in Italy and one of the largest in Europe, that will be led by the very talented Monica Mondardini. GEDI will have total revenues of ~€700 million, profitability among the highest in the sector, and will be debt-free. It brings together numerous historic and authoritative titles such as La Repubblica, La Stampa, Il Secolo XIX and the many vibrant local newspapers of FINEGIL, with an aggregate average circulation (paper and digital) of around 740,000 copies per day, more than 5.8 million readers and some 2.5 million unique digital users every day. The shares of the combined company will be distributed to FCA shareholders during 2017 and EXOR will become its second largest shareholder. Like La Stampa, RCS also moved on to a new phase of ownership in 2016: it is now owned and led by a very capable entrepreneur, Urbano Cairo, who has successfully built and bought multiple Italian media properties over the past 20 years. Urbano became seriously interested in RCS and offered to buy the company on July 8th 2016 at a "nice" premium. This was not only good for FCA's shareholders, but also for RCS itself, which will benefit hugely from his talent, focus and stability. I would like to close this section on publishing with what I believe is some rational optimism. The market for information remains large and is growing so if you provide reliable and high quality news I believe you will do well. The Economist, one of our other investments, is a good illustration of this – over the past ten years it has substantially increased its paid subscriptions volumes (but not by discounting prices). In the past 12 months alone, overall circulation revenues have grown 21% including newstand. I also believe that advertisers, especially large consumer goods businesses, will want to have more control over where their ads go, so you will see more socially conscious ad spending that should benefit serious news organizations. So, if you provide valuable information in a professional way, you have a future and indeed a prosperous one in the newspaper business... Which is ultimately the only way to preserve the independence of newspapers. A bright future is precisely what Juventus is building, year after year. It ended last season with increased revenues‎ (€388million) and profits (€4million) but, above all, with outstanding success on the pitch in the form of a fifth consecutive Serie A title. This matches the achievements of the greatest Juventus team of all time, that of the "five golden years" in the 1930s. We have had five incredible seasons played out at the J-Stadium, "our home" - as the club's Chairman, my cousin Andrea Agnelli, calls it. The J Stadium was inaugurated back in September of 2011 and helped to rejuvenate a zone on the outskirts of Turin, thanks to the newly inaugurated J Medical Center and the J Village that will open soon. From that moment, Juventus has significantly extended its supporter base (in addition to 14 million supporters in Italy, the Juventus fans worldwide are now more than 300 million). We made one new investment in 2016, which was in Welltec, where we acquired 14% of their equity for ~€100 million. Welltec is a Danish company that was founded by Jørgen Hallundbæk, to commercialize his revolutionary invention of a robot able to operate in horizontal or highly deviated oil and gas wells. Welltec’s robotic device, later branded as the “Well Tractor”, is capable of crawling inside oil wells, conveying tools at great distances and depths and performing sophisticated maintenance and exploration operations. This innovative approach is much easier to deploy, more cost effective and safer than existing technologies. In addition to its robots, Welltec has also developed a range of sophisticated valves and annular barriers targeted at the well completion market. Oil and gas companies use these to lower their well construction costs, extend the reach of their wells and maximize oil or gas reservoir contact, production and drainage. Welltec is currently present in more than 25 countries and holds over 120 patents. In 2016 Welltec, along with the entire industry, was affected by the unprecedented and sharp downturn driven by the drop in the oil price. However, Welltec’s financial performance during the down-cycle has been significantly more resilient than that of its peers. For example, while Welltec’s revenue declined by about 23% in 2016 (in line with the industry), the company delivered an EBITDA margin of 36% (a record amongst its peers). We were fortunate to be invited to invest in Welltec by Ruthi Wertheimer whose family sold ISCAR/IMC Group (Israel’s leading Industrial company) to Berkshire Hathaway, and since then has been successfully investing in minority stakes in family-controlled, and often family-run, specialized industrial businesses. We have learned a lot from Ruthi's investment approach and are fortunate to have her on EXOR’s board. We believe there is an interesting market opportunity for EXOR to establish these types of “partnerships” with extraordinary entrepreneurs like Jørgen by providing long-term capital and helping them to build great companies. The sense of this approach was captured well by one the world’s leading entrepreneurs Jeff Bezos when he said: “If everything you do needs to work on a three-year time horizon, then you’re competing against a lot of people. Just by lengthening the time horizon, you can engage in endeavors that you could never otherwise pursue. At Amazon, we’re willing to plant seeds and let them grow”. So is EXOR. This activity will now be carried out by PartnerRe as part of its investment business, so we have divested substantially all of our financial investments. All that remains is for us to redeem the Black Ant Fund in June 2017, which has delivered a 7.7% yearly average return since 2012. We used all our cash in 2016 (keeping just some cash equivalents) to acquire the remaining 90.1% of PartnerRe’s common shares. We then used our cash flow to reduce our gross debt, as our dividend flow has improved substantially thanks to PartnerRe, with a net ordinary cash flow of ~6x over the previous year. As approved at our shareholder meeting last year, treasury shares were cancelled. We will always do this except for those shares we will retain to service equity incentive plans. In 2016 we focused on reducing our Gross Debt, both through asset disposals and dividends received. Our disciplined approach to managing liabilities, aided by the performance of our assets, brought our loan-to-value ratio down under 20% at the end of the year, as targeted, with a Gross Debt of $3.8 billion. Last year saw the launch of our first eurodollar transaction in the form of a 10-year private placement, representing an increase in our USD exposure within our overall liability structure. We successfully priced a $170 million bond, resulting in savings of 20 basis points compared to a Euro public market transaction. We also took advantage of the attractive terms offered in the low interest rate environment to reopen our 10-year notes due in December 2025 for €200 million. The average cost of our debt in 2016 was 1.52% in USD and 3.16% in Euros (excluding the 5.375% bond due to mature in June 2017). The higher cost of the Euro denominated debt is due to its longer maturities. As we enter 2017, the level of uncertainty in the world has clearly increased. However, one lesson that I learned from studying my great- great -grandfather Giovanni Agnelli is the importance of being resilient and adaptable. He lived through two world wars, the rise of communism and fascism and unprecedented technological changes that underpinned the industrial revolution. Through all of this he built and sustained one of the largest industrial companies in the world. Above all we must always look to the future, foresee the future of new inventions, be unafraid of “the new”, delete from our vocabulary the word "impossible". 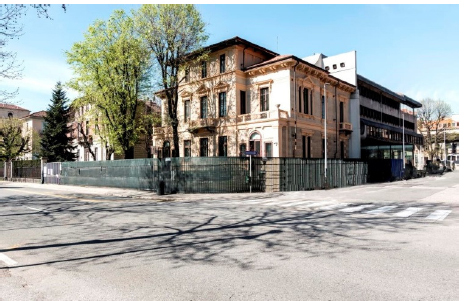 On the occasion of the 150th anniversary of the Founder’s birthday in 2016, we decided to transform his house in the center of Turin into the new offices for the Agnelli Foundation. It has become one of Italy's largest philanthropic institutions since it was established in his memory 50 years ago, and it has made a notable contribution over the years to Italy’s development. We are strongly committed to ensuring that this continues, and indeed grows, using its inspiring new home as a base. We would love to show you this transformation, so we have decided that the renewed building will host EXOR’s first annual investor day on October 5th, 2017. I very much hope you will be able to join us there. It will be an opportunity to learn more about our businesses and, I hope, have a good time.